To enable all users (intra LAN user and road warrior alike) to print to a central server. Use case: print all invoices to the Company's Invoice Print Server. This page defines the printers attached to the FrontAccounting system. Configuring these printers allows you to have the various reports, lists, labels etc to be printed automatically to the appropriate printers once configured. Printer Description: - longer description for users (e.g. printer location or type of printer - color, fast laser etc). Host name or IP: - IP or printserver name. This can be localhost or any print server as known by your DNS service. Port: - Printer daemon listening port. Currently the only supported protocol is lpd, and default port for this service is usually 515. Printer Queue: - Printer queue name (see manpage of lpd) - optional. Timeout: - Timeout on network connection to printer server in seconds. Default is 20. To list your printer queue on linux you can issue: lpq -a command. 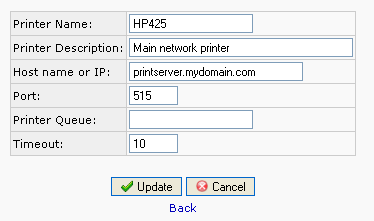 Printer name is displayed in the form: queue_name@local_name. If you wish to use cups server you should enable lpd sevice in it. See cups documentation how to set it. On Debian systems, install cups-bsd package to get lpd functionality. This prints across the net as well to printers behind NAT if the port is forwarded.